TOKYO » A Japanese adventurer aboard a boat powered by ocean waves arrived in his homeland Friday, more than three months after he set sail from Hawaii. Kenichi Horie said good weather and fish he caught along the way made his long journey enjoyable. 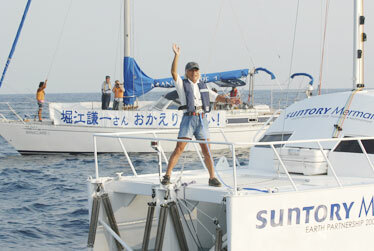 Horie claims the trip was the world's longest solo voyage in a wave-powered boat. The journey would have taken just 10 days in a regular diesel-powered vessel, but Horie said he opted for the wave-powered boat to raise awareness about the environment. TOKYO » Japanese adventurer Kenichi Horie took more than three months to sail from Hawaii to Japan in a boat powered by the energy of ocean waves, but says he was blessed with good weather and tasty fish. "The sea was so calm, and the weather was so great throughout my journey. That's why it took me so long," he said yesterday. The 4,800-mile voyage, which began in Honolulu in March, ended Friday when his 3-ton yacht docked in Wakayama in western Japan. The trip, which Horie claims was the world's longest solo voyage in a wave-powered boat, is just the latest journey using green technology for the 69-year-old sailor. In 1992, Horie pedaled a boat from Hawaii to Okinawa in southern Japan. In 1996, he sailed nearly 10,000 miles from Ecuador to Tokyo aboard a solar-powered boat made from recycled aluminum beer cans. Horie's most recent trip would have taken just 10 days in a regular diesel-powered boat. But he said he is raising awareness about ecology, although his endeavors might take a bit longer. His boat, which relies on wave energy to move two fins at its bow and propel it forward, moved at an average speed of 1.5 knots, slower than humans walk. "I've been thinking about riding a wave-powered boat for 30 years, and finally my dream came true. The journey was so fun, and it was easy," he said in a telephone interview from his yacht in Osaka Bay. Horie ate mostly rice and curry that he brought along on the boat, but sometimes ate squid and flying fish that he caught. The 31-foot boat, the Suntory Mermaid II, was designed to right itself if it capsized and was equipped with an engine and a sail for emergencies. But they were never needed because Horie didn't encounter any storms.